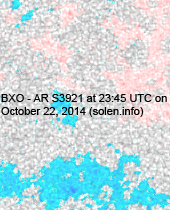 Last major update issued on October 23, 2014 at 05:50 UTC. Updates will be irregular until October 27. 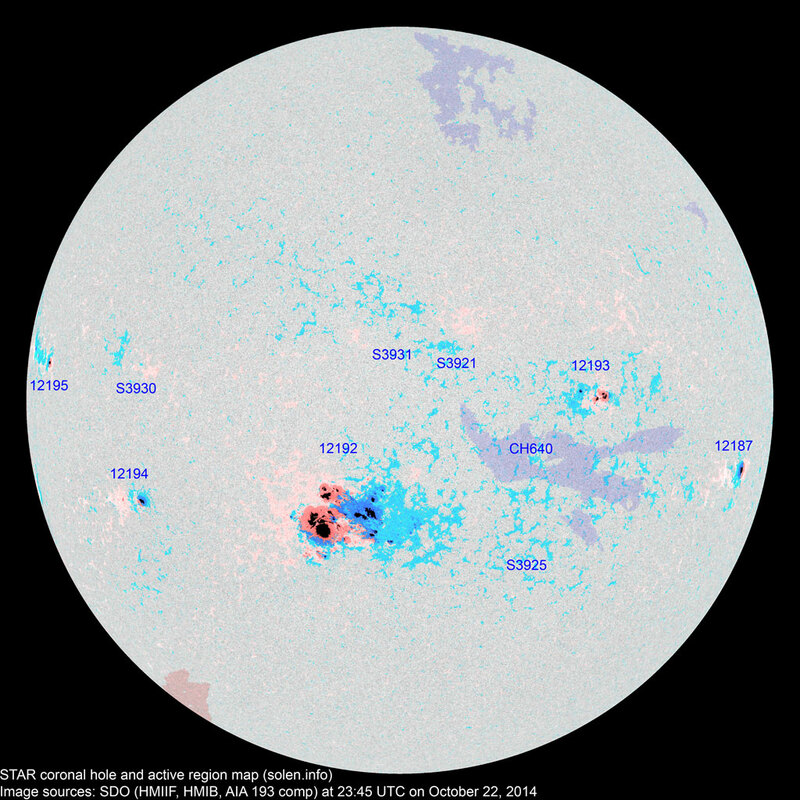 The geomagnetic field was quiet to active on October 22. 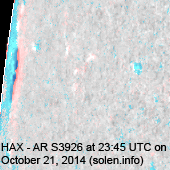 Solar wind speed at SOHO ranged between 450 and 563 km/s under the influence of a high speed stream from CH640. 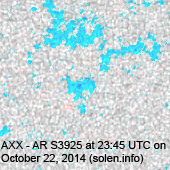 Solar flux at 20h UTC on 2.8 GHz was 216 (increasing 58 over the last solar rotation). 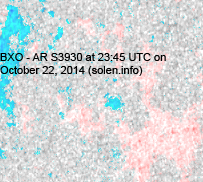 The 90 day 10.7 flux at 1 AU was 138.5. 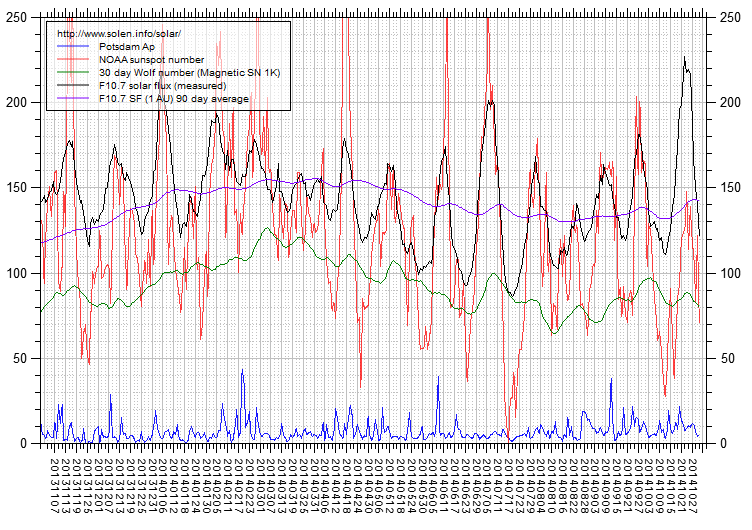 The Potsdam WDC planetary A index was 12 (STAR Ap - based on the mean of three hour interval ap indices: 11.5). 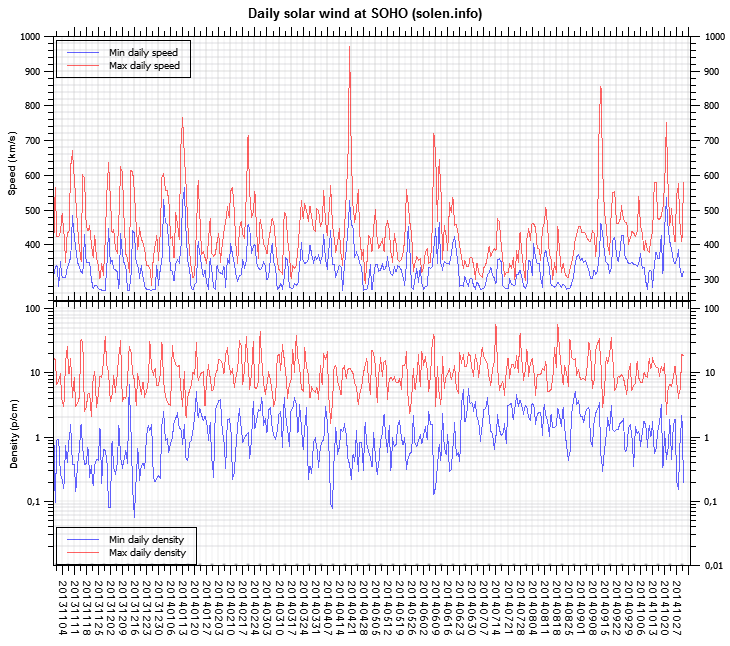 Three hour interval K indices: 43222322 (planetary), 33334321 (Boulder). 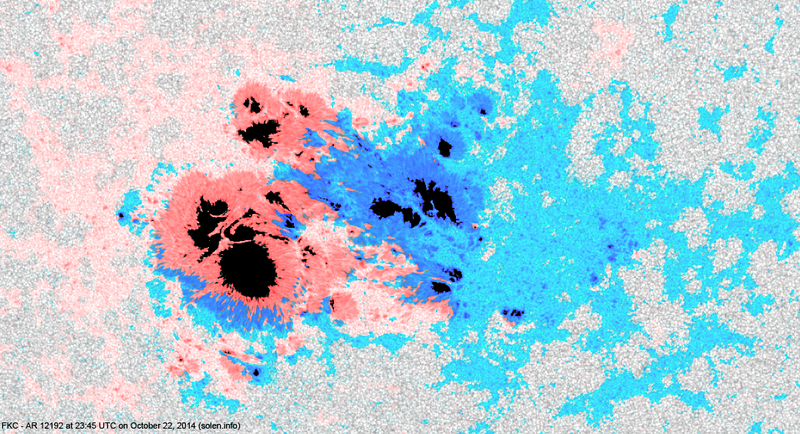 At the time of counting spots (see image time), spots were observed in 9 active regions using 2K resolution (SN: 296) and 8 active regions using 1K resolution (SN: 189) SDO images on the visible solar disk. 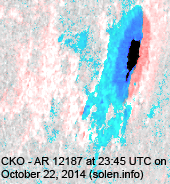 Region 12187 [S09W68] was quiet and stable. 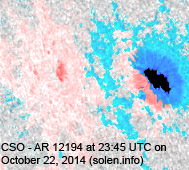 Region 12192 [S14E09] continued to gain spots and area. 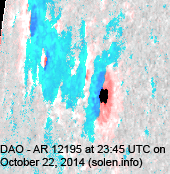 Some penumbral area in the central southern parts disappeared after the X class event. 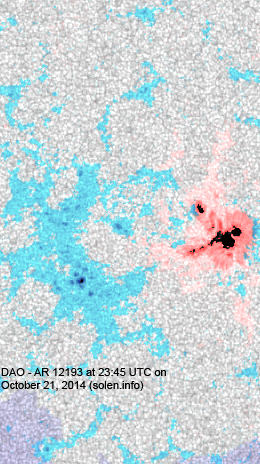 Multiple magnetic delta structures can be observed within the manin penumbral area. 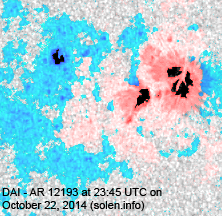 Further major flares are possible. 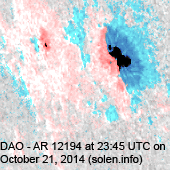 Region 12193 [N04W32] was quiet and mostly stable. 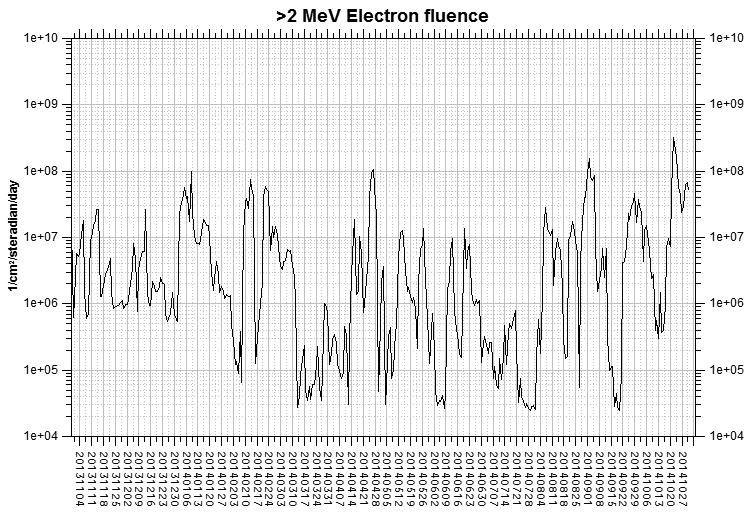 Region 12194 [S12E46] decayed slowly and quietly. 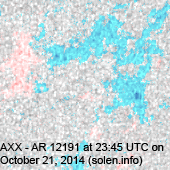 New region 12195 [N08E73] rotated partly into view on October 21 and was numbered the next day by SWPC. 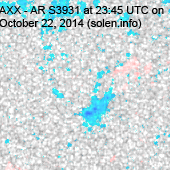 S3921 [N14W07] was quiet and stable. 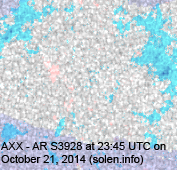 S3925 [S25W23] reemerged with a penumbra spot. 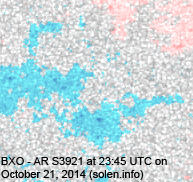 New region S3930 [N08E42] was observed with penumbra spots. 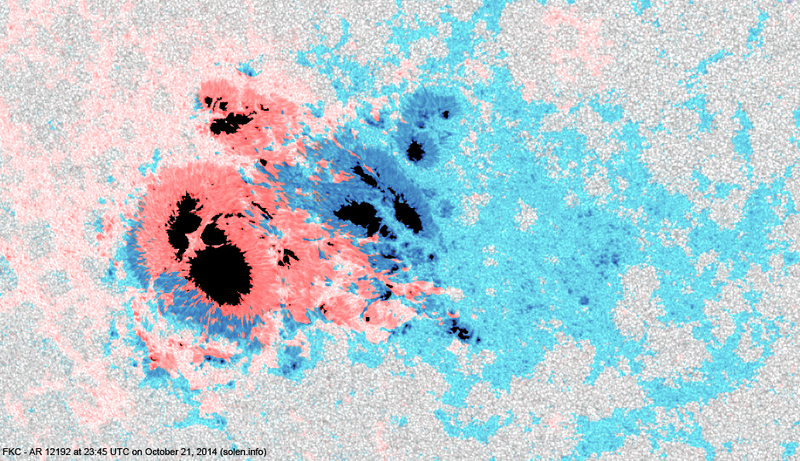 New region S3931 [N13E00] emerged with penumbra spots. 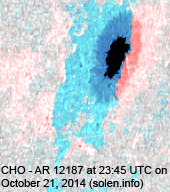 An interesting region just behind the southeast limb displayed significant activity and is obviously capable of producing M class flares. 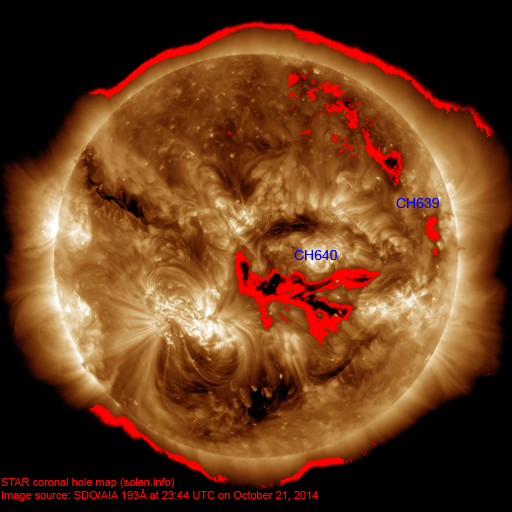 The geomagnetic field is expected to be quiet to unsettled on October 23-25 due to effects from CH640.